My mother-in-law subscribes to National Geographic and I always try to sneak a peek at what National Geographic is covering when I go to her home. It was quite a surprise recently when I found their February 2015 edition, which showcases a veteran on the cover for their “Healing Our Soldiers” article. It’s an interesting read about traumatic brain injury. I don’t want to delve too much on the article as I feel everyone who reads this blog should read it for themselves. Each person will have his or her own interpretation regarding what’s presented–shock, disgust regarding this sort of trauma, intrigue,etc. Please read the article. It’s fascinating as everything else I typically find in National Geographic. What I wish to speak to you all about today is the cover and imagery presented. I’ve already highlighted information I found interesting. The alterations are mine (made on PicMonkey). 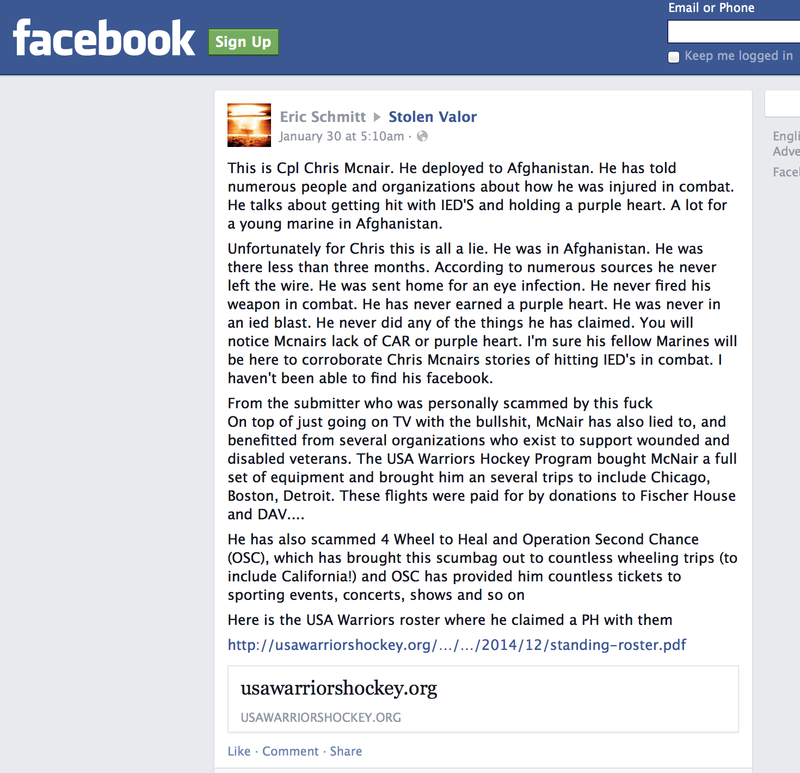 The biggest frustration of mine with the article is the statement: Healing Our Soldiers. 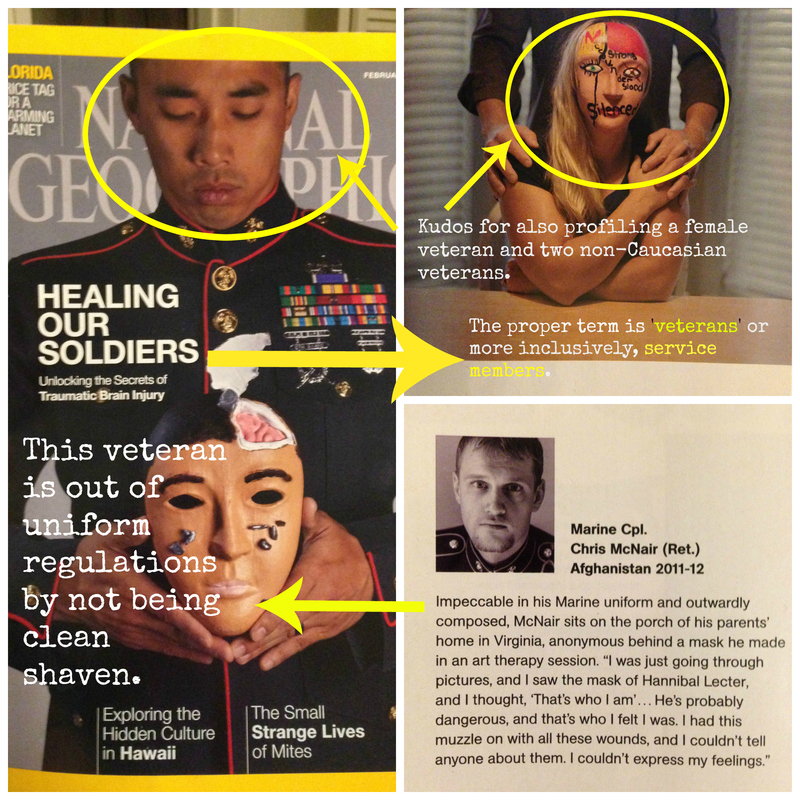 An organization such as National Geographic should be well aware that we are not all soldiers, especially when it takes the time to portray a Marine on the cover. The generic term of ‘soldiers’ is an antiquated way to look at veterans and service members as a homogenous group. We are not all soldiers. I, in particular, get ticked when people call me a soldier. I am a Marine. I earned my title of Marine. I don’t make this statement to downgrade a Soldier’s service. He or she worked to become a Soldier. I worked to become a Marine. If National Geographic wants to look collectively at us [all persons who have served this nation’s military] as a group, ‘veterans’ works well for those who left the armed forces or ‘service members’ to look at the group including those actively serving. My coursework reminds me to look at what is being done right in the article as well. National Geographic decided to show two non-Caucasian men, retired Marine Gunnery Sergeant Aaron Tam and Army First Sergeant David Griego, and one female, Marine Gunnery Sergeant Tiffany H. I don’t know whether the average American realizes the lack of true front lines exposed female service members and non-infantry males to many of the same dangers typically encountered by infantry service members. Improvised explosive devices, a cheap weapon to manufacture, were a common problem on the supply routes and a frequent danger for individuals on convoy operations. With this information in mind, consider the fact individuals who are motor transport, supply, combat camera, and the band [at least speaking for the Marine Corps, because they are augmented to units or fill security roles] fill roles both on and off base. Some female service members, as well, served at entry control points and or as part of female engagement teams in villages. Much of the press I’ve seen focuses almost exclusively on the experiences of young, Caucasian infantry males, by comparison. The individuals in the article seem to be particularly older, probably mid 30’s to early 40’s guessing based on their appearances and respective ranks. However, this controversy is not what my peer was referring to in our discussion. I didn’t see an article with background information but quite an inflammatory response as follows when I typed in search terms looking for further information. Please bear in mind, the language is not mine and I cannot verify the accuracy of the information provided. However, the reaction is worth noting. I don’t think someone would post this sort of response to the ‘Stolen Valor’ Facebook page without there being at least some level of truth based on how disrespectful it is for anyone to claim certain service experiences (Brian Williams’ current debacle comes to mind) or fake military/veteran status.